We’re back ! After a hugely successful presentations to hundreds of VMware Admins at VMworld 2010 and 2011, Kendrick Coleman (of VCE and www.KendrickColeman.com) and David Davis (that’s me, of TrainSignal and www.VMwareVideos.com) are back to give you an updated and encore presentation of our Best Free vSphere Tools for 2011 presentation – in LIVE WEBINAR format ! If you couldn’t make it to VMworld 2011 in Vegas (or were just too busy to attend this session) then this session is for you. This session WON’T be at VMworld Europe so this is your last chance to catch it this year! If you happened to catch our session at VMworld, you would know that we don’t just show 10 tools, it’s probably closer to 30. We give credit where credit is due for all the members of the VMware Community that dedicate time and effort into producing all these free tools. This session appeals to every person who has an interest in vSphere. We will talk about some of the free tools that beginners and novices can use that are easy out-the-box solutions and we will discuss some of the tools that require a bit of CLI work that appeal to those experts out there. We scoured hidden corners of the web to bring you the greatest content available. So come one and all to see the “greatest webinar on earth”! I can guarantee that you will come back armed with more knowledge than you expected because this isn’t a single product pitch, heck, it’s not a product pitch at all. This is a webinar focused on giving vSphere admins what they want, knowledge to overcome obstacles in every day situations. This live webinar will take place on October 26, 2011 at two times in order to make the the entire world happy (well almost). 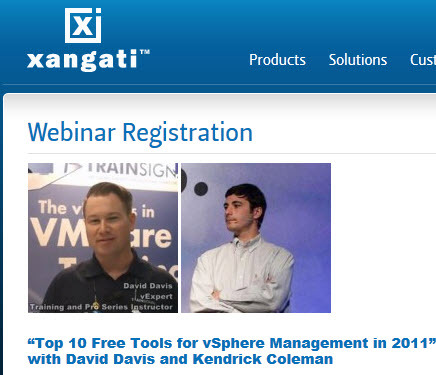 This special webinar is sponsored by Xangati so please help to support their free tool – Xangati for vSphere.